HARRISBURG, Pa. — Powerful ponies from across western Pennsylvania pulled to the pinnacle placings of their divisions in a program at the 103rd Pennsylvania Farm Show. The teams belonged to Howard Krovach, Slippery Rock, Mercer County; David Ferringer, Shelocta, Indiana County; and the Jenny Brothers, New Sewickley, Beaver County. The winner of each division was awarded $400 and a plaque and a Teamster Award was presented to Dan Davis in memory of Howard Blake Sr. at conclusion of the event. – Heavyweight division: first place, Brothers; second place, David Ferringer; third place, the Blakes; fourth place, Daniel Ferringer; fifth place, Brothers. 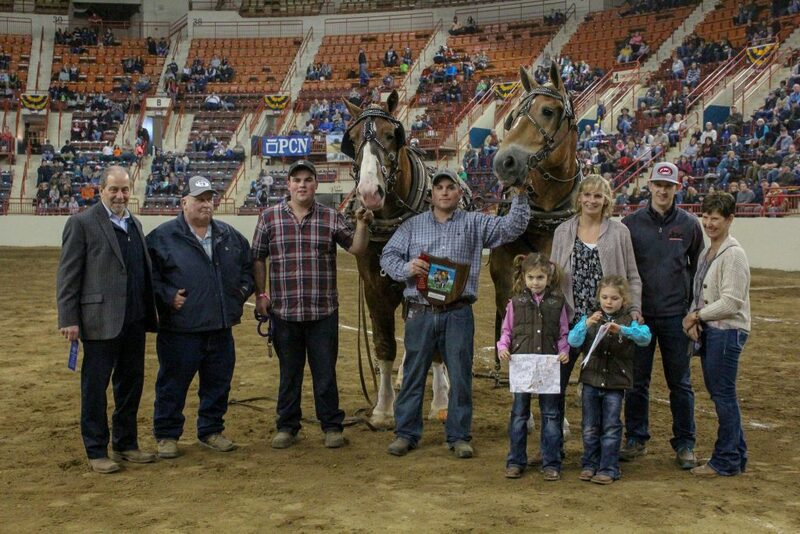 The competition was neck and neck during today’s Horse Pulling Contest at the Pennsylvania Farm Show. The lightweight division team of horses, Tony and Rex, exhibited by Sproat and Howard, Dawson and Acme, Fayette County, made a winning pull of 8,450 pounds. The heavyweight division team of horses, Charlie and Chip, exhibited by The Brown Brothers made a winning pull of 10,250 pounds. The winner of each division was awarded $500 and a plaque. An Outstanding Teamster Award was presented to Bobby Howard in the lightweight class and Casey Harriman in the heavyweight, in memory of Peter C. Buhler and Jack Buhler. – Heavyweight division: first place, Brown Brothers and their team from Acme, Westmoreland County; second place, B. Howard; third place, Scott Brown; fourth place, Mike Buhler and his team from Ridgway, Elk County; and fifth place, John Popp and his team from Beaver.